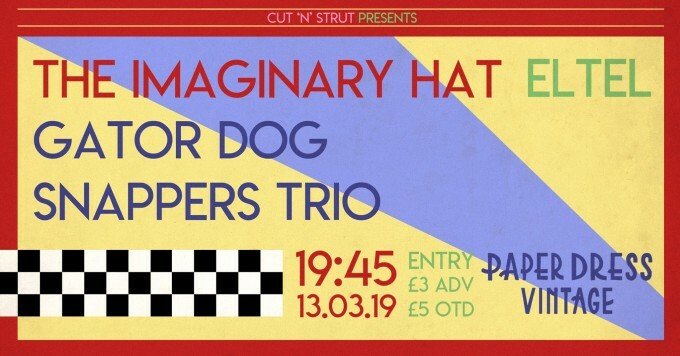 || The Imaginary Hat || Behold the musical stylings of The Imaginary Hat, as they blend rock, punk and 1920s jazz resulting in a sound that’s as distorted as it is danceable. Booming drums, growling trombones and fuzzed guitars. || Gator Dog Snappers Trio || A pared down, acoustic version of your favourite Gospel Brass Band Crew. They play nostalgic originals, unusual arrangements of lesser know songs, and their own raucous and eclectic takes on favourite standards. || ELTEL || combining knock-you-dead originals & left-field covers, in order to beguile, entertain and hypnotise you. Listen out for hauntingly beautiful remakes of those songs you’d forgotten you’d forgotten.